Soon after the Cassini orbiter successfully executed the first of its ring-grazing orbits, it beamed back photos of the northern hemisphere of Saturn, along with the hexagonal jet stream at Saturn’s pole. The ring-grazing orbits are a series of maneuvers where Cassini passes through the outer rings of Saturn. There are twenty such orbits planned, with each orbit being a week long. In April, Cassini will start its final set of maneuvers, where it will pass through the narrow gap between Saturn and the innermost rings. The spacecraft is then going to be de-orbited into Saturn, to prevent contamination of any of the moons of Saturn, which could potentially have life. The cameras captured Saturn a few days before making the closest approach. During the first ring-grazing orbit, there was a focus on obtaining data from other instruments. However, high resolution images of the atmosphere of Saturn, its rings, and the tiny moons that orbit at the innermost rings are expected from future ring-grazing orbits. Carolyn Porco, Cassini imaging team lead at Space Science Institute, Boulder, Colorado said “This is it, the beginning of the end of our historic exploration of Saturn. Let these images — and those to come — remind you that we’ve lived a bold and daring adventure around the solar system’s most magnificent planet.” Cassini is expected to take a closer look and obtain the best images so far of two tiny moons of Saturn: Janus and Epimetheus. Launched in 1997, Cassini has been studying the gas giant for over twenty years. Cassini has discovered a global subsurface ocean on Enceladus, found canyons flooded with hydrocarbons and imaged flowing methane clouds on Titan. Cassini is a collaborative effort by NASA, the European Space Agency (ESA), and the Italian Space Agency. 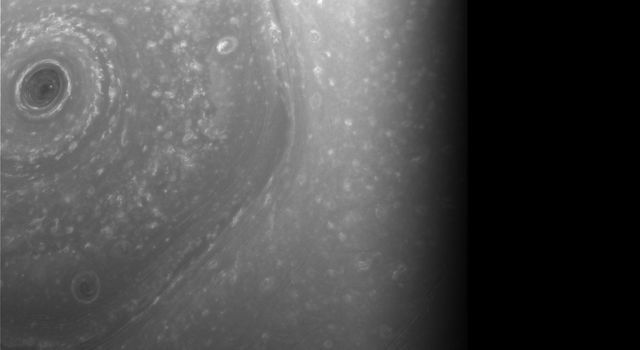 Soon after the Cassini orbiter successfully executed the first of its ring-grazing orbits, it beamed back photos of the northern hemisphere of Saturn, along with the hexagonal jet stream at Saturn’s pole. The ring-grazing orbits are a series of maneuvers where Cassini passes through the outer rings of Saturn. There are twenty such orbits planned, with each orbit being a week long. In April, Cassini will start its final set of maneuvers, where it will pass through the narrow gap between Saturn and the innermost rings. The spacecraft is then going to be de-orbited into Saturn, to prevent contamination of any of the moons of Saturn, which could potentially have life. The cameras captured Saturn a few days before making the closest approach. During the first ring-grazing orbit, there was a focus on obtaining data from other instruments. Cassini is expected to take a closer look and obtain the best images so far of two tiny moons of Saturn: Janus and Epimetheus. Launched in 1997, Cassini has been studying the gas giant for over twenty years. Cassini has discovered a global subsurface ocean on Enceladus, found canyons flooded with hydrocarbons and imaged flowing methane clouds on Titan. Cassini is a collaborative effort by NASA, the European Space Agency (ESA), and the Italian Space Agency.